In addition to being outstanding teachers, Trinity Prep faculty members are accomplished artists, actors, poets, writers, scientists, mathematicians, athletes, and lifelong learners. 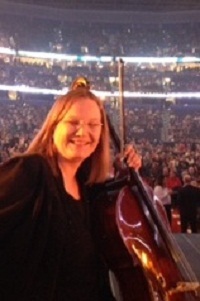 Fine Arts Teacher Maureen May is playing the cello in several holiday concerts this December. On December 14 she played with Andrea Bocelli at the Tampa Bay Times Forum. May is playing in Walt Disney World’s Candlelight Processional from November 29-December 30 at Epcot. She is part of a 50-piece orchestra and mass choir that accompanies a celebrity narrating the Christmas story. The list of celebrities includes Ashley Judd, Whoopi Goldberg, Sigourney Weaver, Dennis Haysbert, James Denton, Steve Curtis Chapman, Blaire Underwood, and Amy Grant. She is also performing in the Orlando Ballet/Orlando Philharmonic production of the Nutcracker at the Bob Carr Performing Arts Centre from December 19-22. May will play at several churches throughout the Orlando area over Christmas as well. The May family is performing at First Presbyterian Church of Orlando on Christmas Eve where they will be joined by their friends from the Orlando Philharmonic Orchestra and alumnus Brian Bak ’05. If you see Mrs. May performing over the holidays, please come and say hello to her!